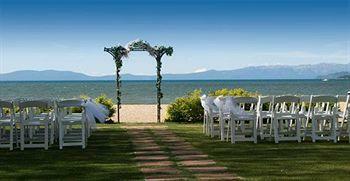 Features: Tahoe Lakeshore Lodge and Spa is the the only all lakefront property on the South Shore. Tahoe Lakeshore Lodge Resort offers accommodations with cozy fireplaces in front of which to curl up with your loved ones, all while enjoying the lake views. 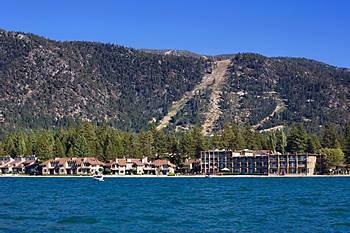 Why We Stay: Lake Tahoe Lodge Spa offers breathtaking views from every hotel room. The aptly named Lake Tahoe Lodge and Spa features an on-site spa to take care of guests' relaxation desires. 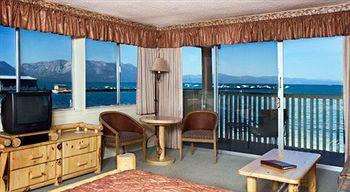 The Views: Tahoe Lakeshore Lodge Spa provides gorgeous views of the water. 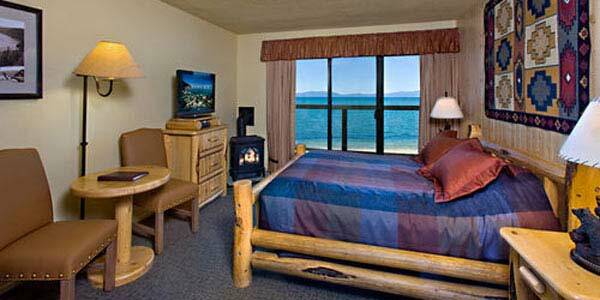 No matter which room you get at Tahoe Lakeshore Lodge Resort, you can rest assured that there will be a rewarding view of this famous body of water. The Spa: Tahoe Lakeshore Lodge Spa makes trips great with ultra-relaxing treatments for guests. While staying at Lake Tahoe Lodge and Spa, guests can enjoy numerous massage therapies, body wraps, body scrubs, facials, waxing, and hydrotherapy. The Location: When guests stay at Tahoe Lakeshore Lodge Spa, it's easy for them to get to area activities, eateries, and casinos. 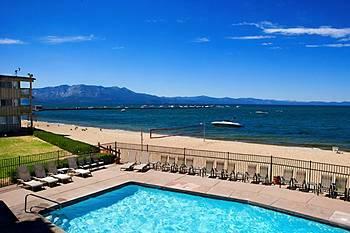 Inside Knowledge: Tahoe Lakeshore Lodge and Spa has its own stretch of private beach that spans 500 feet. Do Relax By The Water: The heated pool is perfect for guests who want to unwind where they can take in the magnificent views of Lake Tahoe. Do Keep It Hot: Guests love spending time in the luxurious hot tub. 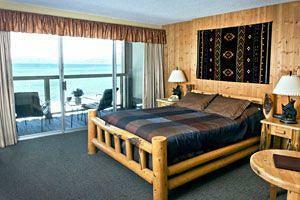 Don't Be Bothered: Tahoe Lakeshore Lodge and Spa provides quiet accommodations that allow for the ultimate relaxation. 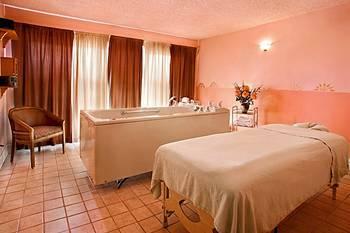 If you want peace and tranquility, Tahoe Lakeshore Lodge Spa can offer that to you. Don't Stay Indoors: During the summer, there is a volleyball court that guests love to use. Tahoe Lakeshore Lodge and Spa has BBQ grills and picnic tables around which families and friends love to gather for a great meal. Guests can also get discounted ski lift tickets from the hotel, use the hotel's ski shuttles, and keep their equipment in the ski lockers next to the lobby. Beautiful! Right on the Water! This is a great hotel! A lot better than it looks in the pictures! It’s actually one of the only hotels located entirely on the beach and lake, and it’s the only place in South Lake with every room having a lake view. So that says a lot right there. 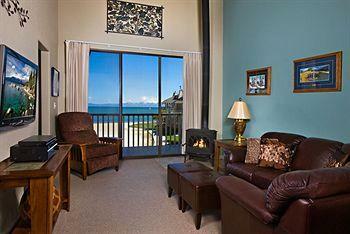 The rooms all have spectacular views of the lake, and ask for a corner room if you really want an awesome view! You can literally walk right out of your hotel room and onto the beach. It’s a really good hotel for the summer, because their private beach has a dock, a pool and volleyball courts set up. The rooms are really nice inside too. In fact, I heard that they just recently renovated them all. They have gas fireplaces, patios, free internet and some even have kitchens. Another great thing, and you would never know it, but they also have a really nice day spa in the hotel. It’s super relaxing inside the spa and they offer all kinds of treatments including couples massages. Overall, this is a great place and if you’re coming to Tahoe in the summer, then I’d highly recommend it. There’s just nothing like being able to walk out your hotel room and be right on the beach. 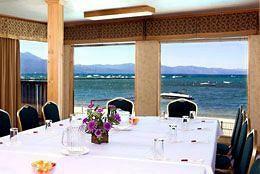 The Queen Lodge room is perfect for lovebirds on the ultimate Lake Tahoe getaway. The super plush queen-size bed sits in the center of the room. Guests will be able to admire the beautiful lake right from their room. The Queen Lodge room comes with either a balcony or ground-floor patio. 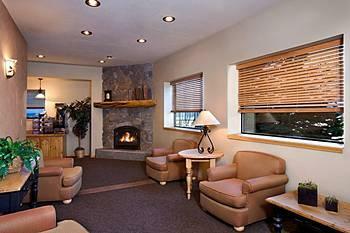 Guests can warm themselves in front of the gorgeous gas fireplace. When boredom strikes, the cable TV with a DVD player is ready to be played at anytime. For the caffeine buzz that you'll love, there is a coffeemaker. It's easy to do work thanks to the complimentary wireless Internet access. In case you're wondering, the bathroom in the Queen Lodge room features a stall shower. Spend your Lake Tahoe trip in the ultimate comfort. The one bedroom condo will give you a great night's sleep on its dreamy queen-size bed. You might think the lake views you can see outside your room are a painting. Rest assured, it's the real deal! You can pinch yourself to make sure you're awake if you want. The ground-floor patio attached to your room gives you direct beach access. Read a book by the wood-burning fireplace, snuggle up with loved ones in front of the cable TV (and DVD player), and make all kinds of tasty delights in the kitchen. The kitchen gives you all you need to cook up a storm: a four-burner range, microwave, full size refrigerator and freezer, dishwasher, coffeemaker, toaster, and cooking/eating utensils. Another cool perk of this room? Complimentary wireless Internet access. The bathroom in this one bedroom condo gives you options with its combination tub and shower. Give yourself more space in the Two Queen Lodge room. You and yours can spread out in the two luxurious queen-size beds. The Two Queen Lodge room comes with one of two amazing possibilities: a balcony or ground-floor patio. Warm right up in front of the gas fireplace. Enjoy in-room entertainment with the cable TV and DVD player. 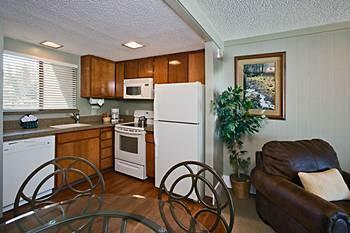 Make yourself a cup of joe with the coffeemaker, and hop onto your Facebook with complimentary wireless Internet access. The One Bedroom Loft Condo is perfect for the group that wants plenty of room. The One Bedroom Loft Condo comes with one queen-size bed and two twin-size beds. Come with the whole family, or settle in with a group of your friends. You can step out onto the patio for some great conversation and views of the lake. When you step back inside, you can relax by the warm crackling fireplace or watch something entertaining using the cable TV and DVD player. The kitchen will please the fledgeling chef: it comes with a stove-top, microwave, refrigerator and freezer, dishwasher, coffee/tea maker, cookware, and linens. You'll enjoy wireless and wired high-speed Internet access when you stay in the One Bedroom Loft Condo. The bathroom has a combination tub/shower and a hair dryer for your beauty needs.